Professor Kappelhoff's areas of expertise are criminal law, police accountability and reform, criminal procedure, civil rights, and human trafficking. At the University of Minnesota Law School, he directs the Criminal Justice Clinic, teaches a seminar course on Human Trafficking, and consults regularly on issues related to the criminal justice system and civil rights laws. Professor Kappelhoff recently returned to the Law School after a serving as a Deputy Assistant Attorney General in the Civil Rights Division of the Department of Justice. In this position, he was in charge of the Division’s enforcement efforts related to policing practices, human trafficking, and hate crimes. Among his many responsibilities, he oversaw the Department’s criminal and civil police investigations in Ferguson, Mo., Baltimore, and other police departments around the country. He played a key role in the Justice Department’s police accountability and criminal justice reform efforts. And, he supervised the federal hate crime investigation into the shooting at the Emmanuel Baptist Church in Charleston, South Carolina. Panel Discussion: “Questioning the Trajectory of Mass Incarceration Policy"
Mario L. Barnes is the Associate Dean for Research and Faculty Development and Professor of Law at UC Irvine, with a joint appointment (by courtesy) in Criminology, Law & Society. He is also a Faculty Affiliate in the UCI Center in Law, Society & Culture, the Co-Director of the UCI Center on Law, Equality and Race (CLEaR), and previously served as Senior Associate Dean for Academic Affairs for the law school from 2011 to 2014. Professor Barnes studies the legal and social implications of race in the areas of employment, education, criminal and national security law. His recent works include: “Judging Opportunity Lost: Race-Based Affirmative Action and Equality Jurisprudence After Fisher v. University of Texas,” forthcoming in 62 UCLA Law Review __ (2014) (with Erwin Chemerinsky and Angela Onwuachi-Willig); “The Obama Effect: Specialized Meaning in Anti-Discrimination Law,” in 87 Indiana Law Journal 325 (2012) (with Angela Onwuachi-Willig); and “Analyzing Stops, Citations, and Searches in Washington and Beyond,” in the 35 Seattle University Law Review 673 (2012) (with Robert S. Chang). From 2004 to 2009, he was a faculty member at the University of Miami School of Law, and from 2002 to 2004, he served as a William H. Hastie Fellow at the University of Wisconsin Law School. 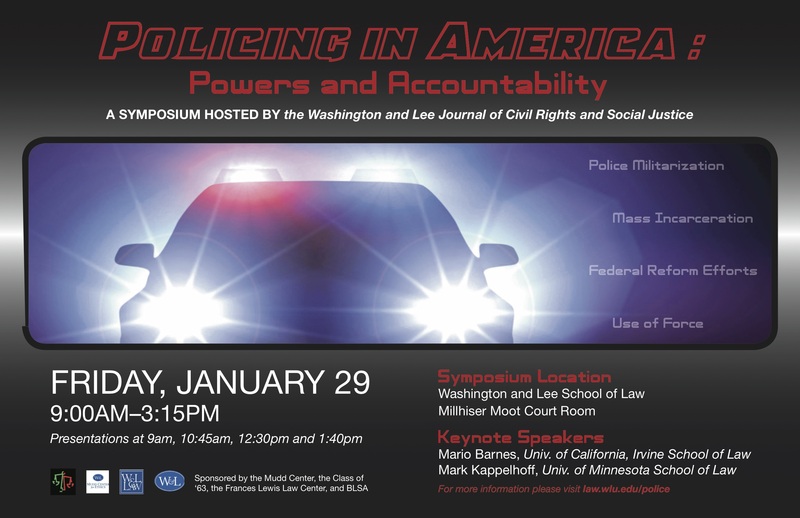 Panel Discussion: “Examining Trends in Police Militarization"